Well, a new brand to me anyway, and an interesting one at that. This is going to get long, so let's just get right down to business shall we? Read on! If you take a look at most of your skincare products, and you're going to find that the first ingredient is water. 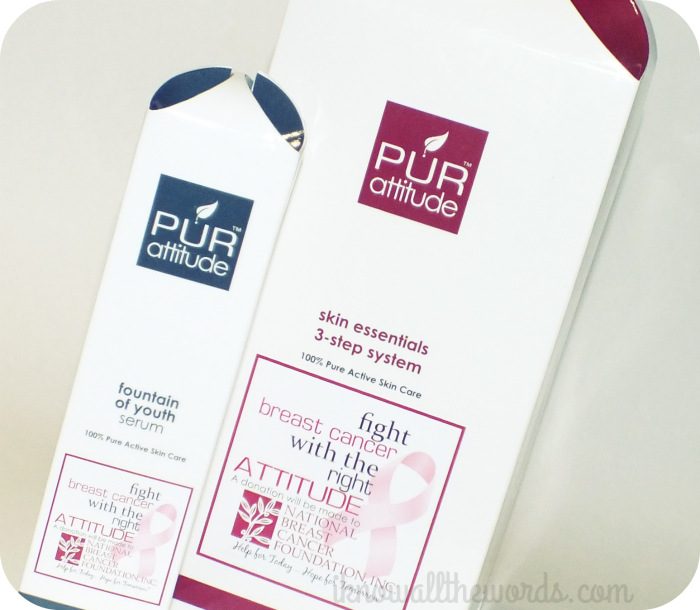 Pur Attitude products contain zero water. Whaaa? Crazy right? Their products all contain Hyaluronix technology as a base (which water is usually used as.) Hyaluronix delivers up to one thousand times its weight in water and binds moisture deeply into the skin. The main ingredient being sodium hyaluronate, which is in the sodium salt of hyaluronic acid. I didn't exactly know what that was... do you? I did a bit of research to make it all make a bit more sense. You likely know that hylauronic acid is beneficial in skincare- it's a pretty common buzzword- but it's not easily absorbed into skin when used topically. Sodium hyaluronate is smaller than hylauronic acid, and as such able to penetrate skin better. Not too shabby right? If you're curious and want more info, you can find it here. Pur Attitude's creator, David Pollock (who has worked with a ton of big names in the industry - SkinCeuticals, Bliss, Lancome, L'Oreal, and more) is a proponent of 'Safe Beauty' in which he believes consumers should be aware of the ingredients used in their products as many skin care products do contain ingredients that are known carcinogens. As an advocate of such principles, Pur Attitude is free of harsh chemicals, parabens, glycols, sulfates, petro-chemicals, synthetic fragrances and artificial dyes. Phew! I know that was wordy, so lets get to the actual products, yeah? I will say that I haven't been using this products for much time- just about weeks- so this is just a quick analysis. Ingredients for the products in the 3 Step System can be found here. This post is long enough without them! Pur Attitude Purifying Rice Face Wash is a soap-free cleanser with self adjusting beads that both gently exfoliate and remove makeup, dirt and oil. Because this is soap-free, you don't get lather, which I have to admit seems odd at first, but cleanses skin really well and leaves it feeling like skin- and by that I mean perfectly clean but not dry or tight and feeling incredibly soft. It also has a light citrus scent from tangerine oil. 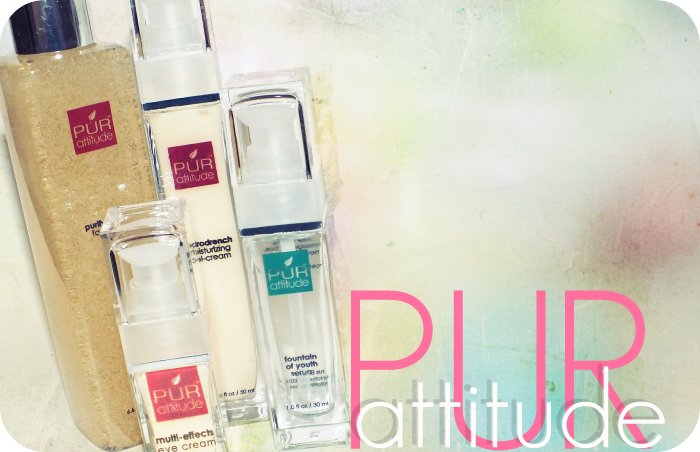 Pur Attitude Multi-Effects Eye Cream has a similar gel-cream feel as the moisturizer and absorbs just was quickly. It's said to work well to reduce puffiness and decrease the appearance of fine lines, but I don't really have either, so I can only really report on the fact that it is really hydrating without being too rich/ heavy. Are you still with me? One last product and it's a good one. Trust me. 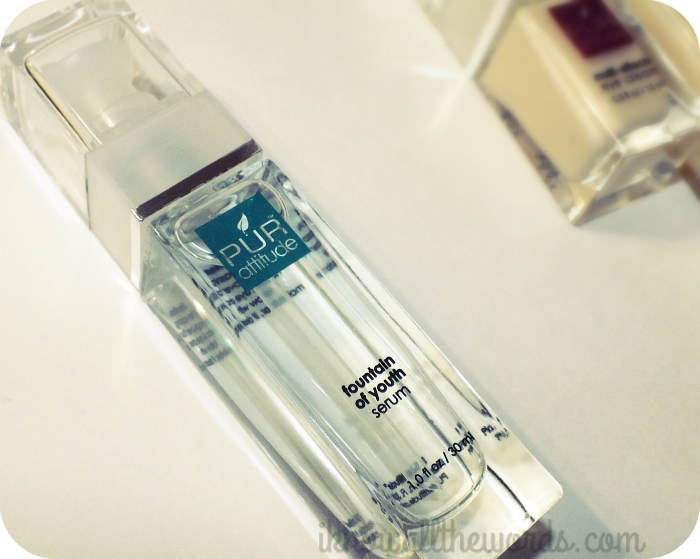 Pur Attitude Foundation of Youth Serum is interesting in that while it's a serum, it does provide hydration, and I've already noticed results since using it in combination with the 3 step system. My skin easily looks dull and is prone to being dehydrated but it looks more radiant and 'fresh'. My dry 'problem areas' are pretty much non existent, and my skin feels incredibly soft. I don't see anything wrong with any of those things! All of the products- save for the cleanser- are housed in weighty glass square bottles and perfect little pumps. Seriously, I love the pumps. I know, an odd statement, but these pumps are shaped for your finger and allow for the perfect amount of product to be dispensed. Love it!